Hyderabad is one of the prominent cities on the Deccan Plateau one of the good things about Hyderabad is that its surroundings are still more or less rustic and just 20 Kilometers outside of the city and Mother Nature welcomes you with open arms. The city is close to small hills that though fighting with the sand and stone mafia still are beautiful in their own rights. 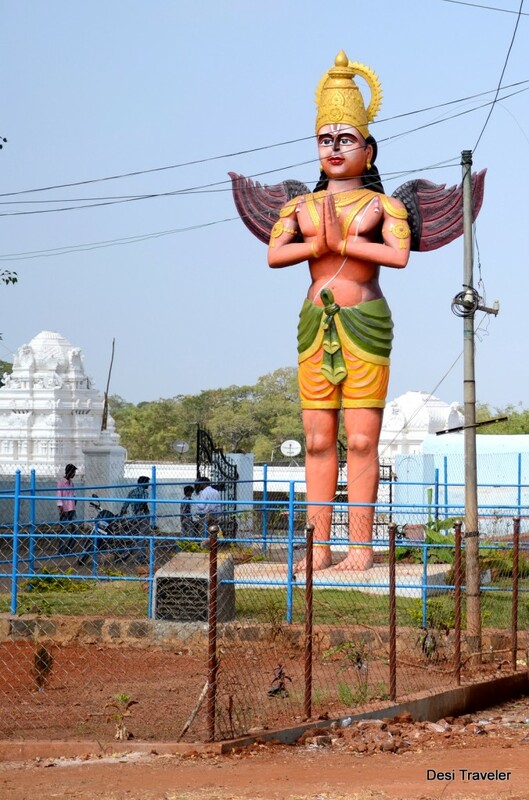 But in this post, we will visit Ananthagiri hills in Vikarabad, specifically the Anantha Padmanabha Swamy Temple Vikarabad and Nagasamudram Lake. Only about 90 KM from the city, you can reach Vikarabad in around 2 hours if you drive leisurely.Coming from Gachibowli or Mehdipattnam takes exit 18 on the road to the airport and then follow road signs to Vikarabad. There is only one decent hotel in the hills owned by Telangana Tourism, It is a decent property almost on the summit with a beautiful view of the valley below and a well-maintained pool available for a charge of around INR 50-100 per hour depending on how much of Archimedes principle you will prove. ( meaning kids are charged less and adults more ) As I mentioned in one of the earlier posts that we visited the same with GHAC for night trekking in the Ananthagiri hills. 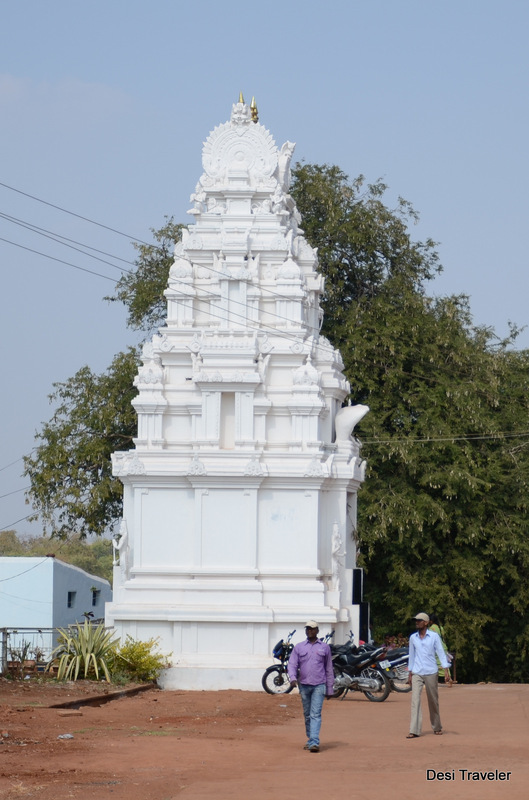 We drove to Vikarabad, though you can take a train to Vikarabad or a bus that goes to Tandur and get down at Vikarabad, from there the temple is around 7 KM and auto-rickshaws are available to take you to the summit. Haggling over price is bound to happen here with the Auto drivers. What to do in Vikarabad : Besides the trekking in the hills, you also have a fresh water lake called Nagasamundram and the famous Anantha Padmanabha Swamy temple in the hills. The temple has a unique history if the legend is to be believed. The governor of the province Vikar had a dream in which lord Anantha Padmanabha Swamy came in his dream and asked him to build the temple. The temple is believed to be at the same spot where in the ancient days Lord Krishna has appeared as Anantha Padmanabha Swamy and is believed to have blessed a sage to become river Musi once the lifeline and main water supply to Hyderabad, now trying its best to take away the title of most polluted drain from the Yamuna in Delhi another river with Krishna connection. That is the amount of respect we have for our mythological rivers. For the inquisitive types, Anantha Padmanabha Swamy is the Seshasayee form of Vishnu or Vishnu resting on Seshanaga who balances earth on one of his heads. The other famous Anantha Padmanabha Swamy temple is in Kerala (The one famous for the 7 chambers with 22 billion $ fortune and counting with one chamber still unopened!!!). So what if we are a country of poor people, our netas, abhinetas, babus and sethjees and now gods are fairly rich. ( hey prabhu forgive me to put you in same sentence as the papee ones… but how are you supposed to get rid of them if I don’t put you next to them). 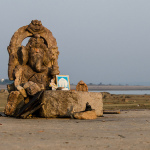 We were part of the GHAC group and staying in The Telangana Tourism resort, that can be your base and you can actually walk to the temple from there. Which is what we did and arrived at the temple in about 20 minutes walking leisurely. If you are the true religious types try your luck at renting one of the rooms in the temple itself, and if you are the camping type, the jungle can be your camping ground. There are no man-eaters big cats reported in the area ( as of today) It is a small temple in rock cave kind of enclosure and only a few people are allowed at a time as it gets very hot and suffocating in the sanctum sanctorum. Cameras are not allowed inside so leave them in your car or locker. Don’t forget to collect the laddus and other Prasad items from the counter against payment. The laddus are very good, though not comparable to Tirupati laddus. 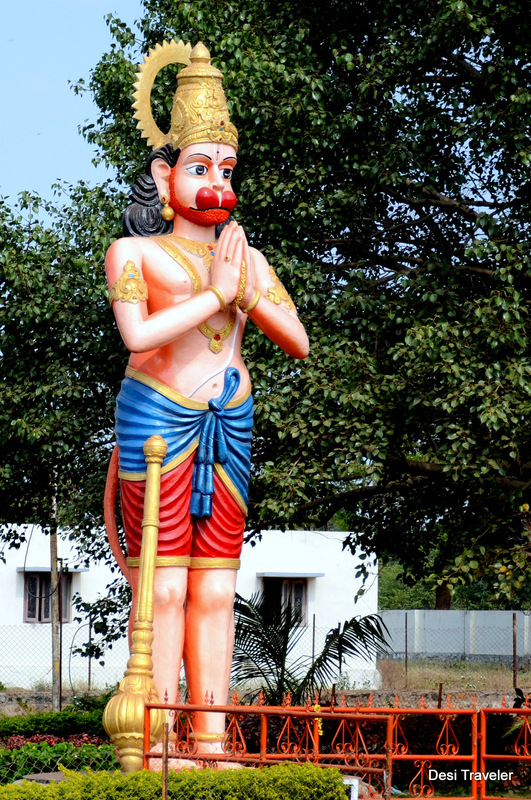 The highlights of the temple are two large statues of Garuda and Hanuman standing guard at the entrance of the temple. Both of them have folded hand as if welcoming the guest to the abode of the lord. Soon the time to go home came but the kids were not willing to come back and wanted to stay another night, only a promise to take them to their favorite junk food joint convinced them to jump in the car. 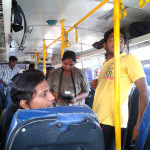 How to reach: Buses are available from MGBS ( Mahatma Gandhi Bus Stand in Hyderabad), you can drive and reach in around 2 hours enjoying the scenery around you. Follow this google map from Hitec city to the temple. Where to Stay: Your best bet is Haritha Hotel, operated by Telangana Tourism giving a beautiful view of the Valley behind it and a very inviting pool. Accommodation is available in the temple subject to availability, there is also a forest guest house that can be booked in advance by contacting the forest department. ( tough though). 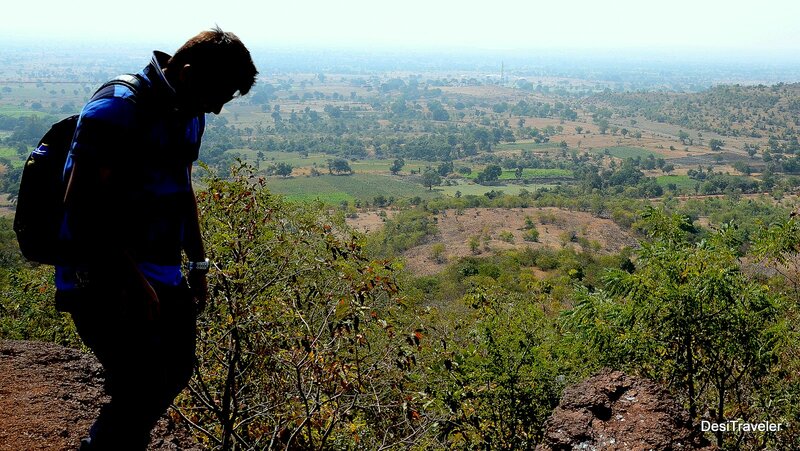 If you are the adventurous types you can also camp in Ananthagiri Hills after due permissions from Forest Department. 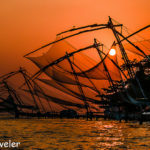 If you are based in Hyderabad you may want to check this list of places to visit in and around Hyderabad. Better check with the forest department…. What may be the cost for camp per night.. I need a break from hyderabad a road trip for a day along with my husband. Hope this is the right place to visit with minimum journey and peaceful scenic nature. Feel free to give suggestions of places to visit. We visited the hills once, but did not go to the lake! Hey it was fun to read about the place.. 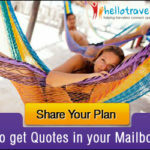 I am traveler too and love to blog about it.. 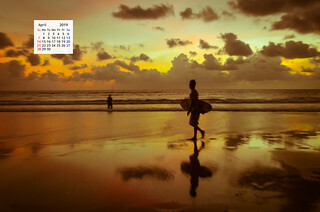 Very good post , I love travelling and like travelling related information a lot, thanks for this information.